Aggie athletics celebrated another impressive academic report from the NCAA last Tuesday (Nov. 15) and kept celebrating all week, honoring a coaching legend and defeating Sacramento State twice: in the Causeway Classic football game and in men’s basketball in the new Golden 1 Center — in the first college basketball game ever played there. 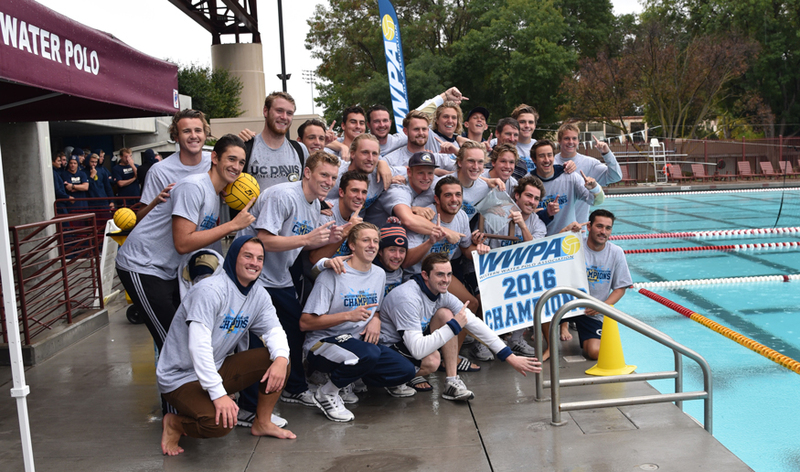 The men’s water polo team made a splash, too, capturing the Western Water Polo Association title and a play-in berth in the NCAA championship tournament. Basketball player Michael Onyebalu meets with Michelle Roppeau, director of Academic Services. UC Davis’ NCAA Graduation Success Rate of 88 percent led the Big West Conference for the fifth straight year and the eighth time in nine years at the Division I level. The memory of coach Jim Sochor is forever present in Aggie Stadium (where the field is named after him), and now he has a place outside the stadium, too — in the form of a bronze statue. A dedication ceremony (see Facebook photo gallery) preceded the Causeway Classic on Saturday (Nov. 19). The Sochor likeness gazes toward the field where the Aggies defeated the Hornets, 48-30, to keep the Causeway Classic trophy — a concrete boring (from the causeway) with a silver plaque — for the second year in a row. On Sunday (Nov. 20), the No. 8-ranked men’s water polo team defeated No. 14 UC San Diego, 12-8, to give the Aggies their first conference title since 1997. With the win, the Aggies moved to 23-5 on the year — breaking the school record for single-season wins. Next up for the Aggies: They’ll play either Harvard or Bucknell in a play-in game at UC Berkeley’s Spieker Aquatics Complex, on Thursday, Dec. 1 (time to be announced), for a spot in the semifinal round of the NCAA men’s water polo championship. Harvard and Bucknell have a play-in game of their own, this Saturday (Nov. 26). On Monday (Nov. 21), the women’s basketball team headed to Spanos Center in Stockton, while the men’s team traveled to Sacramento’s new downtown arena. The women’s team defeated Pacific, 95-87, for a 3-0 start to the season. Next up: The Aggies host Montana at 7 p.m. Wednesday (Nov. 23) and Hofstra at 1 p.m. Sunday (Nov. 27). The men’s team made history in the Golden 1 Center, not only by playing in the first college basketball game to be played there, but by winning it, 81-72. It was the Aggies’ fourth consecutive win, for a 4-1 record, going into the Great Alaska Shootout later this week. The Aggies open play at 8 p.m. Thursday (Nov. 24) in the tournament that runs through Saturday (Nov. 26). Golden 1 Center: Former @sacramentokings guard and current @ucdavisaggies coach Jim Les patrols the sidelines.